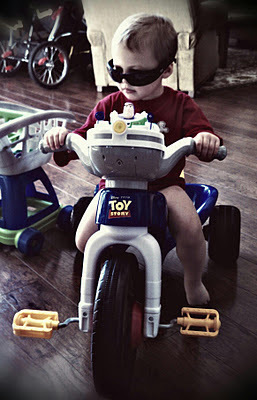 Our little Potty-training Easy Rider. This past week was the week I have had some anxiety about since Abbey was born--it was the first week that I had both kids to take care of all by myself. We were so blessed to have my parents come to stay with us for the first week after Abbey was born. Then, Drew's parents stayed with us from Sunday evening until Wednesday mid-day for the following three weeks. This was another big blessing for which we are very thankful. Drew used the remaining 6 days of his paternity leave from work on Thursday and Friday of those three weeks. This week, Abbey turned 4 weeks old and this was my week to fly solo. I must say that I have really grown a lot this week. I can now say I have more patience and I am a lot more laid back than I used to be-- which has arisen out of the need to survive. If I failed to grow through the experiences that I had this past week, then I probably would not survive. I am a very energetic person who likes everything to be perfect. Well...things just don't always go your way with a potty-training two year old and a newborn ruling the roost. This past week I have been reminded again just how much is really out of my control. Once again I have learned to give my anxiety back to the Lord. Things are so much easier this way. Just for a snapshot into one of my days this past week, I will post a copy of a text message that I sent to Drew mid-day on Tuesday, about 15 minutes after he called me to ask a question. Luke had just started potty training this past weekend, so it was very new to him. (He has done so well and actually not had that many accidents in his pants as I would have expected. He has been peeing pretty regularly in the potty at his own will when he feels the need to go and even poo-pood twice on Sunday in the potty). He was getting tired, as it was close to nap time. Being tired + being two years old often leads to unexpected and sometimes not-so-desirable behavior. "Since I spoke to you: Luke peed in pants and underwear...he sits on potty...Abbey wakes up...I put diaper on Luke for nap...change Abbey's diaper. She starts crying....I start feeding her. Luke poops...Abbey poops two minutes into feeding. bring her and Luke into room to change. .. change Luke...change Abbey...Abbey poops in new diaper...no more Abbey diapers are in the room downstairs...run to diaper bag to get one...now feeding her again." A follow-up message said: "Those are the highlights. I didn't include details like the four times I washed my hands in that time frame." Drew posted this pic to Facebook this past week with the caption, "Daddy's sunglasses, Mommy's shoes, no pants. Standard issue potty training uniform." Luke actually was a very good boy for the most part this week. He only had a few incidents of misbehaving. I found the most difficult part was trying to give him adequate attention while constantly caring for Abbey. When I wasn't feeding her or changing her diaper, I pretty much wore her all day every day this week in a sling that I picked up this past weekend. She loves it and it gives me a good alternative to the Bjorn carrier. Luke also loved his sling when he was an infant and it was great for use when he was fussy. I am now finding that since I am chasing an energetic two year old around constantly, the sling (and Bjorn Carrier) are necessities. The other difficulty this week has been getting only a few hours of sleep per 24 hours and caring for the kids. Abbey has had several awake and fussy periods this week during the times devoted to sleep. Other than these difficulties I would say the week has gone pretty well. Luke started a Mother's Day Out/preschool today also. I can tell I am going to love my Tuesdays and Thursdays. I was able to schedule a doctor's appointment, have a quick lunch with Drew and do a little shopping while he was in school. In the future, I am going to try to use at least some of the time to catch up on some sleep. :-) Luke is used to napping around 12pm every day. We have been trying to push it back, because his school doesn't finish until 1:30p, so I was a little worried for him today. He actually made it all the way home after I picked him up without falling asleep. He did make a comment on the way home though that I thought was really cute: "Mommy, our home is far away." Poor guy...that 15 minutes home for him was really hard. He told me he liked school though and we talked about all of the fun things he did as we drove home. I love a challenge, and this week I found myself establishing goals each day that seemed impossible, just so I could accomplish them and feel great about doing so. For example, on one day I washed, dried and cleaned three loads of laundry. I was pretty excited about that. On another day, I made a trip to Wal-mart. These accomplishments would probably seem like a small feat for most, but those with a newborn and toddler would probably completely understand. And those were some of the lessons I learned from my first week alone with a potty-training two year old and newborn. Girl I can totally understand how you are feeling!! I remember my first time to walmart with two kids by myself.. I even took a picture of it! :) I also remember that when Jason was either at work or training in Kansas I barley had time to talk to him because I was busy with 2 little kids!! Let me tell you though life with two gets a lot easier over time and you get used to doing things with 2 kids. I think you are right though Tuesday and Thursday are going to be your favorite days!!!! :) One day you will look back on this and think If I can do that I can do anything!! !